Hou Yifan keeps rolling while Humpy Koneru stunned! Zhukova polished Humpy off with 28…Qxc1+! and after 29.Qxc1 Rb8! white was completely lost. In action today at the Women’s World Cup qualifier, the big story was top-seed Humpy Koneru of India dropping her game against Natalia Zhukova of the Ukraine. Perhaps the Indian underestimated the strength of the passed c-pawn and her pieces were tied down. Then Zhukova uncorked a scintillating combination sacrificing her queen with 28…Qxc1+! When the smoke cleared white had gotten rid of the thorny c-pawn, but the white queen was no match for the double rooks and all black had to do with march the a-pawn up the board. Humpy contemplated a defense by ran out of time in doing so. Devastating loss for the rating favorite. Will Humpy be able to bounce back? She is still looking for the elusive world title and is looking to avenge three match losses against Hou Yifan. may have to carry the Indian flag. Both Hou Yifan and Zhao Xue totally demolished their opponents while veteran Pia Cramling and young upstarts Dronavali Harika and Mariya Muzychuk won their games. This may represent the changing of the guard in women’s chess as a young crop of players are dominating the affairs. However, other veterans players like former World Champions Zhu Chen and Antoaneta Stefanova will continue to compete. Unfortunately, one of these two players will be gone as both play each other in this marquee matchup. Former World Champion Alexandra Kosteniuk is also in the running. – Natalia, congratulations with your victory! Please tell is about your thoughts during the game. – Thank you. I just tried to equalize in this game, did not want to show any aggression. Up to some point Humpy played very consistently, and if she continued the same way, the game would probably end in a draw. When I decided to put my pawn on c2, I just thought it will be the safest option. My chess understanding suggests that Black cannot have any problems with the pawn on c2! Even if I lose some material, this pawn will be my insurance, so to speak. Maybe this was the critical moment of the game. When she played 22.Qe2 instead of taking on c2, I responded with 22…Bf5 and was happy about my position. I did not worry about Humpy taking on d5, I just protected my pawn on c2 and created a number of threats. The position after capturing on c2 I considered equal, however, after the game I checked it on the computer, and it gave White advantage. But I don’t know why, maybe computers just overestimate queens! Then Koneru got nervous and started to make mistakes. Her moves 25.e4 and 26.f4 are clearly inferior. She simply lost the thread. Her position was comfortable earlier, and she knew she could make a draw at will, but after 22…Bf5 there is no easy draw! The pawn on c2 is there, White cannot get rid of it, and she must calculate a lot on each move. After 25.e4 Bg6 I will take on c2, on b3… 26.f4 is simply a blunder, because after 26…Qxb3 I found the following trick: 27.f5 Qb6! with a highly dangerous pin. The bishop is immune due to 28…dxe4, and everything is pinned. If the king retreats to h1, then Black sacrifices a queen by 28…Qxd4 29.Qxd4 dxe4, and the c2-pawn decides. Something like this happened in the game – I happily gave up a queen. Humpy, Kosteniuk bounced from tournament… Hou forced to tiebreaks. 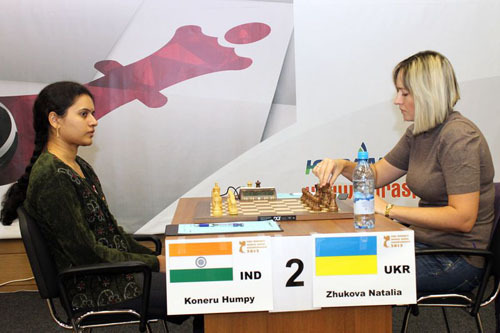 Chess headlines used the word “shock” to describe Humpy Koneru’s loss to Natalia Zhukova in yesterday’s encounter. When Zhukova added another win at Humpy’s expense a bit more than a shock may have filled up the headlines. With Humpy suddenly whitewashed, a lot of quizzical looks and shrugged shoulders were additional expressions. What will become of Humpy Koneru the promising phenom from India? Having failed at yet another chance at an outright rematch, she will have to rely on her second-place finish in the Grand Prix to claim any chance at a rematch. Does Antoaneta Stefanova have enough for another title shot? 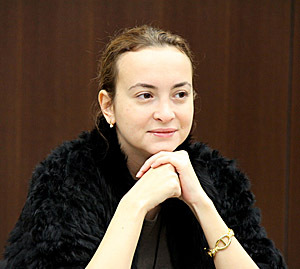 Photo from http://chess2012.ugrasport.com/?cat=9. Hou Yifan also had a tough go of it as Monica Socko as the Chinese player dawdled in the middlegame with a series of rook moves. Finally a queen sacrifice was unable to give white sufficient play and black seized control. Chinese compatriot Zhao Xue also took a loss before move 40. Nino Khurtsidze’s 35.Rxd6! gave white tremendous play. Both Hou and Zhao will be forced to a tiebreak along with Ushenina – Muzychuk, Kosintseva – Mkrtchian, Cramling – Krush, Zatonskih – Ju. Hou Yifan ousted, loses crown! Anna Muzychuk, Pia Cramling also gone. Hou Yifan was all smiles before the match, but in tears after. She loses her crown and now becomes a challenger. Photo from http://chess2012.ugrasport.com/?cat=9. After Humpy Koneru’s exit in the World Chess Cup, chess fans got an even bigger shock when Hou Yifan was bounced from the tournament by Poland’s Moniko Socko. 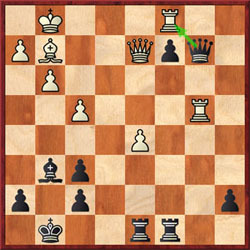 The first rapid game featured a horrible blunder by the World Champion when allowing 42…Bxf3. Thus, there will be a new “World Champion”. This all seems so strange since if Hou would have won, then she would have faced Humpy Koneru and not the runner-up of this tournament. Nevertheless, Hou will be the challenger of the winner by virtue of winning the Grand Prix circuit. In the Battle of Annas, third-seeded Anna Muzychuk was eliminated by Anna Ushenina after being throttled in both rapid games. The Ukranian made an incredible blunder in game one dropping her queen in a total illusion. In the second game the tense battled ensued with black holding the edge. After the white king scampered across the board (with the queen in pursuit) it ran into a brick wall and was mated. Nadezhda Kosintseva dominated both of her whites against Lilit Mkrtchian’s French and moved on. She will face her sister in the next round! This will have to be a “first”. In Cramling-Krush, perhaps the Swede had given up her chance at glory and gave little resistance to the American. 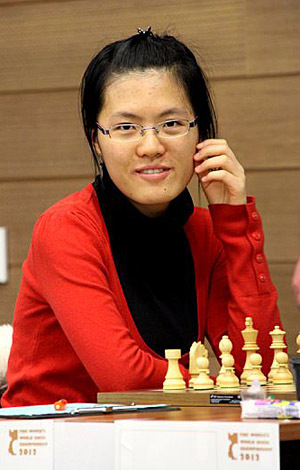 Ju Wenjun beat the other player from the U.S. Anna Zatonskih by winning both rapid games.